We’re the height of alpine fashion! Normally, winter comes to the Colorado high country like a door slamming. But not this year (or at least not yet this year). It’s early November and highs are still in the 50s in the mountains there’s hardly a hint of white even on the highest peaks. I can sit here and grumble about it being unseasonable or I can take these looking-forward-to-ski-season lemons and turn them into extra-late-season-trail-running lemonade. Steve is a Night Run regular and can easily hold his own on local trails. But we’ve never run together in the mountains (nor even in the daylight). It turns out he’s never been to Wild Basin, or even on a, as he puts it, proper mountain run, so we headed to this southernmost enclave of Rocky Mountain National Park for our late-season fun. Wild Basin is really trail runner’s paradise; the good stuff is really good, but it’s a long way from the trailhead and most people hike elsewhere for a quicker payoff. I had a lot of fun showing him around one of my stomping grounds. Steve, in daylight no less. Ouzel Creek immediately above the falls. Prime on the list of spectacular, moderate trail runs in Wild Basin is Bluebird Lake. We proceeded up the well-traveled trail past the three waterfalls (Copeland, Calypso, and Ouzel) admiring the views and the lack of snow. It was hovering in the 40s, but the sun was shining and we were working hard. 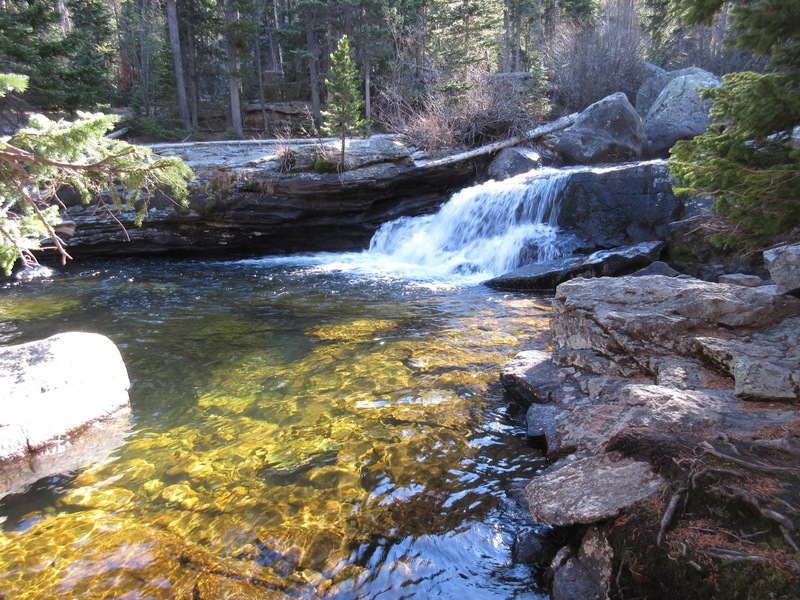 At Ouzel Falls, we took a left along the cliff band and found a nice path up to the gorgeous meadow above. 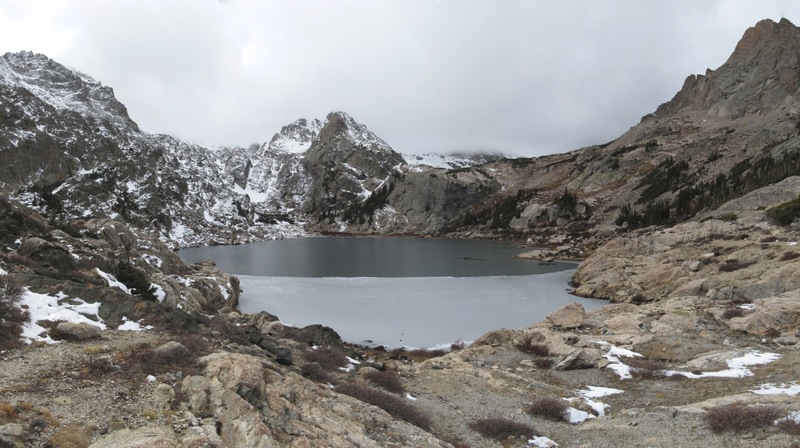 From there, it was easy to regain the Bluebird Lake trail and we made good time all the way up to the lake. Iced-over, but I wouldn’t walk across it yet. In the last mile, we transitioned from appropriately bluebird weather on bare trail, to patches of thin snow and ice under the ominous, orographic cloud roll on the Divide. It is November, after all, and the wind was really howling up there. North faces held new snow, but we didn’t have any trouble in regular running gear scrambling up the steep last half mile to the lake. We didn’t linger at the lake, only tarrying long enough to take a few quick pictures. It was windy and, technically, snowing. The inviting waters of Copeland Falls. But it’s November and some of that white stuff is ice. The trip down was gloriously fast trail-pounding all the way to the trailhead. This is the longest run I’ve done in a few months and we set a pretty good pace. Definitely going to feel this one tomorrow, but what a way to finish off the “summer” 2016 season! 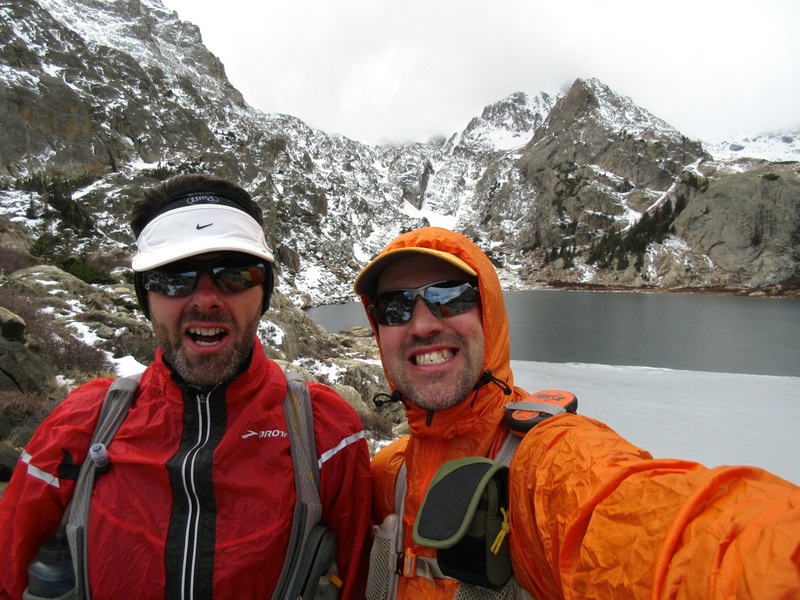 This entry was posted in running and tagged Bluebird Lake, november, Ouzel Falls, rocky mountain national park, steve, trail run, Wild Basin. Bookmark the permalink.